CMT - Anthony Antonellis, Ph.D.
Anthony Antonellis, an assistant professor of human genetics and neurology at the University of Michigan in Ann Arbor, was awarded an MDA research grant totaling $253,800 over three years, to study how mutations in genes that code for specific enzymes cause Charcot-Marie-Tooth disease (CMT). 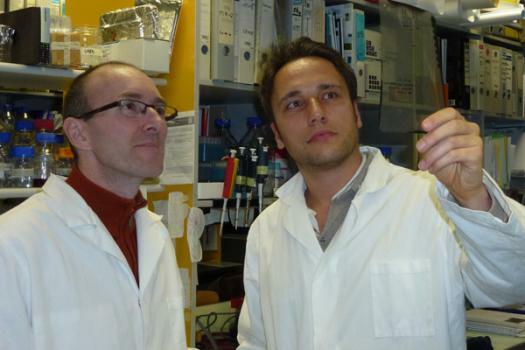 Antonellis and colleagues will conduct experiments in cells to see how genes for enzymes called tRNA synthetases lead to CMT-causing abnormalities and whether restoring the function of these enzymes could be beneficial in treating CMT. Funding for this MDA grant began May 1, 2014. 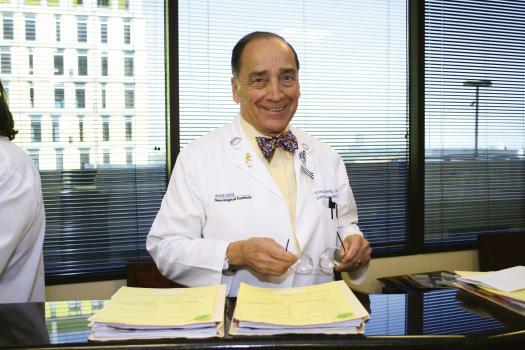 ALS - Stanley Appel, M.D. 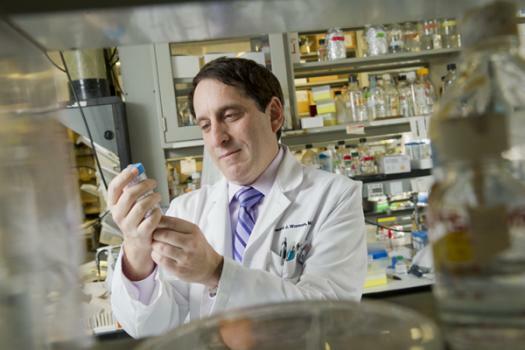 Stanley Appel, a professor of neurology at Methodist Neurological Institute in Houston, was awarded an MDA research grant totaling $253,800 over three years to study immune mechanisms in amyotrophic lateral sclerosis (ALS). Experiments previously conducted by Appel and colleagues in mice with an ALS-like disorder have shown that the immune system acts to protect nerve cells during the early stages of the disease but that it damages nerve cells in the disorder’s later stages. The mouse studies suggest that manipulating aspects of the immune system could improve ALS outcomes. 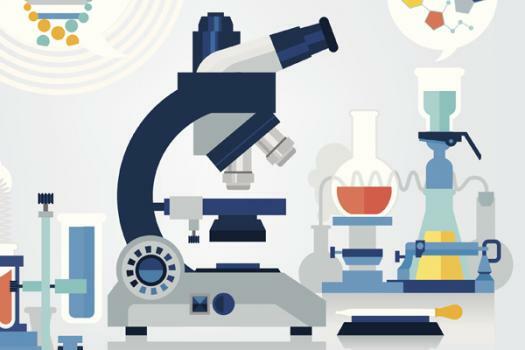 With the new funding, Appel will investigate whether the same immunologic changes seen in the mice occur in ALS patients and whether they follow the same time course. If so, these “immune hallmarks,” Appel says, have the potential to be used as biological indicators of the effectiveness of therapies that alter the immune system. 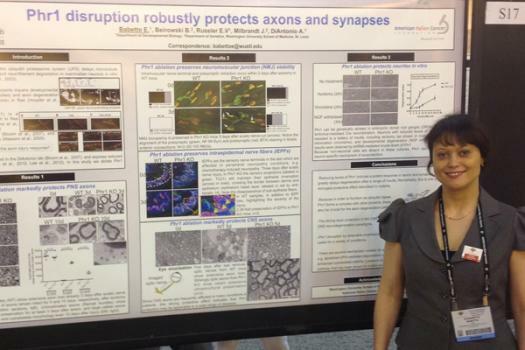 CMT - Elisabetta Babetto, Ph.D.
Elisabetta Babetto, a postdoctoral research scholar at Washington University in St Louis, was awarded an MDA research development grant totaling $152,280 over three years to study the possible role of a protein called PHR1 in degeneration of nerve fibers in Charcot-Marie-Tooth disease (CMT). In experiments in mice with a CMT-like disorder, Babetto will see whether manipulating the biochemical pathway associated with the PHR1 protein can improve the health of nerve fibers. 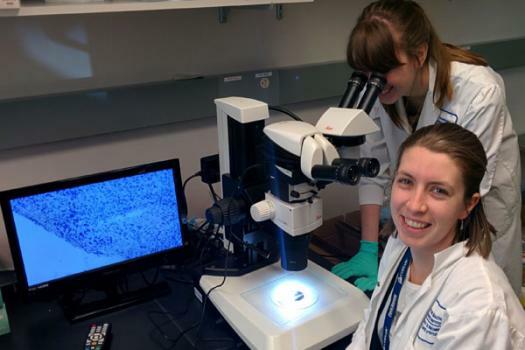 “These experiments will improve our understanding of axonopathy [nerve fiber abnormalities] and have the potential for novel treatments in CMT patients,” she says. Muscle disease - Mariah Baker, Ph.D.
Mariah Baker, a research associate at the University of Texas Health Science Center at Houston, has been awarded an MDA development grant totaling $152,073 over three years to study how the release of calcium molecules is triggered in muscle cells. Improved understanding of this process could have implications for treating a variety of muscle disorders. Funding for this MDA research grant began May 1, 2014. MMD/DM - Andrew Berglund, Ph.D.
Andrew Berglund, a professor of biochemistry, biophysics and molecular biology at the University of Oregon in Eugene, has been awarded an MDA research grant totaling $253,800 over three years to pursue changing the shape of the abnormal genetic material underlying type 1 and type 2 myotonic muscular dystrophy (MMD or DM). Berglund and colleagues will conduct laboratory experiments to see whether changing the shape of abnormally expanded genetic material (RNA) in these two forms of MMD can reduce or eliminate their harmful effects. 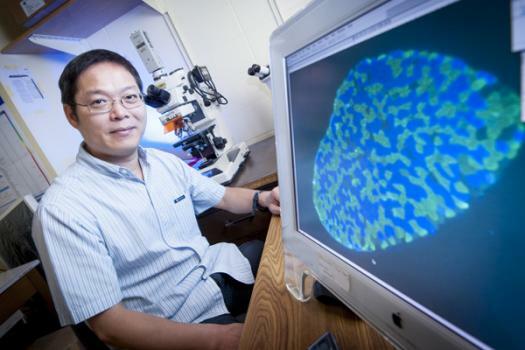 MM - David Chan, M.D., Ph.D.
David Chan, a professor of biology at the California Institute of Technology in Pasadena, has been awarded an MDA research grant totaling $253,800 over three years, to study mitochondria in mice. Mitochondria are the energy-producing parts of cells, and an aspect of their normal functioning involves fusing together and dividing. 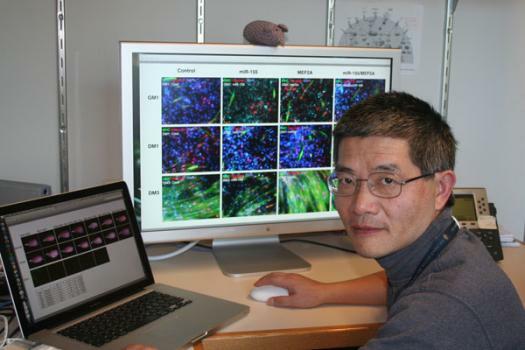 Chan and colleagues will study mice with defects in the fusion or division of mitochondria to improve the understanding of mitochondrial myopathies. 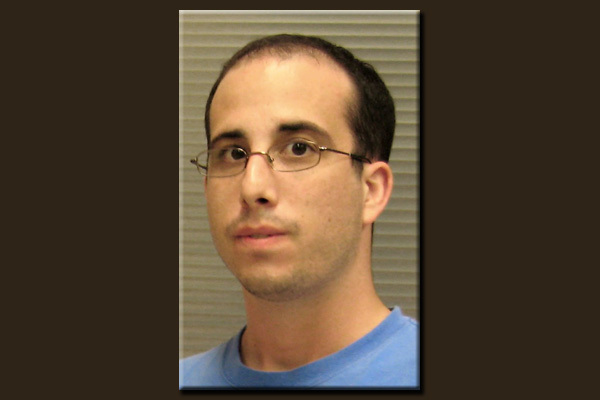 CMT - Gavriel David, M.D., Ph.D.
Gavriel David, an associate professor of physiology and biophysics at the University of Miami’s Miller School of Medicine in Florida, has been awarded an MDA research grant totaling $253,800 over three years to study calcium overload in nerve cells in Charcot-Marie-Tooth disease (CMT). David and colleagues have previously studied mice with CMT-causing genetic defects that disrupt the myelin sheath that coats nerve fibers, finding that disrupted myelin sheaths are associated with abnormally large increases in calcium in nerve cells. Now, they will investigate the apparent relationship between disrupted myelin and calcium overload, with an eye to treating CMT. DMD - Dongsheng Duan, Ph.D.
Dongsheng Duan, a professor in the Department of Molecular Microbiology & Immunology at the University of Missouri in Columbia, has received an MDA research infrastructure grant totaling $169,200 over two years to develop and maintain a national canine tissue bank so that investigators studying Duchenne muscular dystrophy (DMD) will have access to normal and dystrophin-deficient tissue samples taken from dogs. Dystrophin is the muscle protein that is missing in DMD patients. Successful establishment of this tissue bank is expected to accelerate DMD research in numerous directions. DMD - Nicoletta Filigheddu, Ph.D.
Nicoletta Filigheddu, a molecular biologist at the University of Piemonte Orientale Amedeo Avogadro in Italy, has been awarded an MDA research grant totaling $253,800 over three years to investigate whether a hormone called ghrelin can improve muscle regeneration or the success of muscle stem cell transplantation in mice with a disorder mimicking Duchenne muscular dystrophy (DMD). ALS - Aaron Gitler, Ph.D.
Aaron Gitler, an associate professor of genetics at Stanford University in Stanford, Calif., was awarded an MDA research grant totaling $253,800 over three years to investigate how mutations in the gene for a protein called profilin 1 cause amyotrophic lateral sclerosis (ALS). 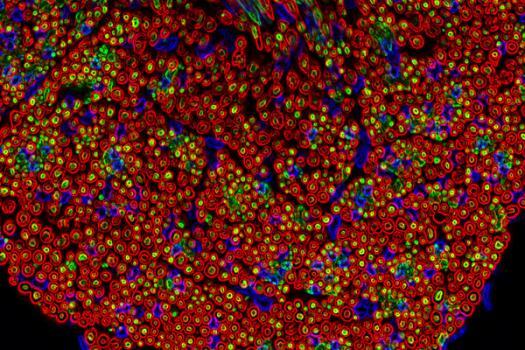 In experiments conducted in cells, Gitler and colleagues have found that the profilin 1 protein may be a regulator of "stress granules" — tiny cellular factories that stores and process RNA molecules — and that further understanding this function may provide insights that lead to ALS therapy development. DMD - Darek Gorecki, Ph.D.
Darek Gorecki, a professor of molecular medicine at the University of Portsmouth in the United Kingdom, has been awarded an MDA research grant totaling $253,800 over three years to study whether blocking a specific receptor (molecular docking site) that enhances inflammation can be beneficial to muscle fibers affected by Duchenne muscular dystrophy (DMD). He will conduct experiments in mice. Nemaline Myopathy - Henk Granzier, Ph.D.
Henk Granzier, a professor of molecular and cellular biology, physiology and biomedical engineering at the University of Arizona in Tucson, has been awarded an MDA research grant totaling $253,800 over three years to study how lower than normal levels of a protein called nebulin affect muscle cells. Nebulin deficiency is the underlying cause of one type of nemaline myopathy. 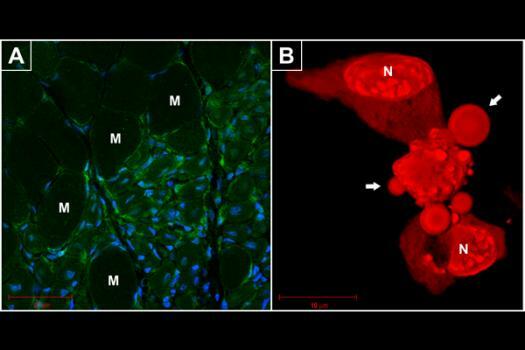 Granzier and colleagues have developed nebulin-deficient mice that develop a disorder resembling human nemaline myopathy. They will conduct experiments in these mice to better understand the basis of muscle weakness in this disorder and to test the effects of experimental treatments. ALS - Maurizio Grimaldi, M.D., Ph.D.
Maurizio Grimaldi, leader of the Neuropharmacology/Neuroscience Laboratory at Southern Research Institute in Birmingham, Ala., was awarded an MDA research grant totaling $253,800 over three years to study the development of molecules that have neuroprotective effects and have the potential to be used as therapies for the treatment of amyotrophic lateral sclerosis (ALS). 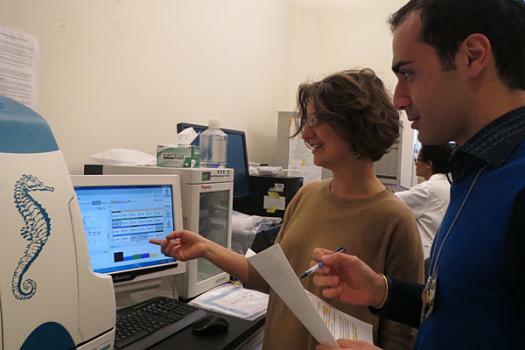 Grimaldi and colleagues have found that two molecules — SR22818 an SR22819 — increase levels of a potentially neuroprotective protein called SOD2 in brain cells. These two molecules were safe and well-tolerated in mice, and they increased life expectancy and improved neurologic symptoms in mice with an ALS-like disease. Grimaldi plans to improve on these molecules and pursue their development as potential therapies for ALS. ALS - Amanda Haidet-Phillips, Ph.D.
Amanda Haidet-Phillips, a postdoctoral student at Johns Hopkins University School of Medicine in Baltimore, was awarded an MDA research development grant totaling $150,717 over three years to investigate how cells known as upper motor neurons, located in the top part of the brain, degenerate in amyotrophic lateral sclerosis (ALS). 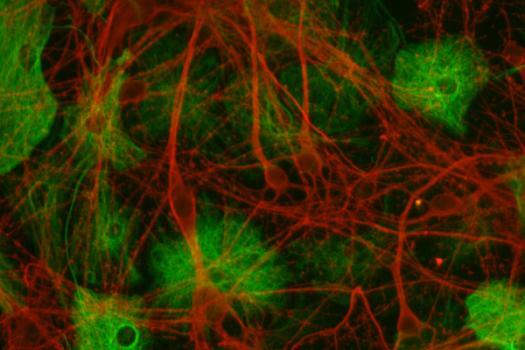 Recently, nervous system support cells called astrocytes were found to cause the death of lower motor neurons, located in the brainstem and spinal cord, and Haidet-Phillips will study whether astrocytes also kill upper motor neurons. By conducting experiments in cells, she hopes to find clues to upper motor neuron loss in ALS and uncover leads to therapy development. Muscle disease - Stephen Hauschka, Ph.D.
Stephen Hauschka, a professor of biochemistry at the University of Washington-Seattle, has been awarded an MDA research grant totaling $253,800 over three years to develop and test new “on-off” gene “switches,” also known as “regulatory cassettes,” to be used in gene transfer therapies to treat muscle disorders. 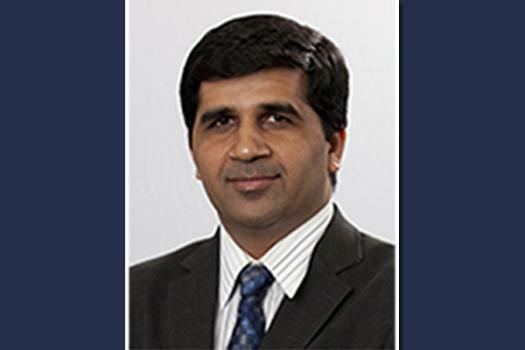 ALS - Muralidhar Hegde, Ph.D.
MMD/DM - Bernard Jasmin, Ph.D.
Bernard Jasmin, a professor in the Department of Cellular & Molecular Medicine at the University of Ottawa, has been awarded an MDA grant totaling $253,800 over three years to examine the role of a protein called staufen 1 in type 1 myotonic muscular dystrophy (MMD or DM) . In this disorder, staufen 1 interacts with abnormally expanded genetic material in muscle cells. Jasmin and colleagues will conduct laboratory experiments to understand the functions of staufen 1, with the goal of developing new strategies for treating type 1 MMD. CMT - Nivedita Jerath, M.D. Nivedita Jerath, a clinical fellow in neuromuscular medicine at the University of Iowa, has been awarded an MDA clinical research training grant to study driving ability in patients with the type 1A form of Charcot-Marie-Tooth disease (CMT). Because of difficulties with strength and balance, as well as foot abnormalities and tight ankles, the disease may affect driving, which requires quick responses, such as slamming on the brakes or turning the steering wheel quickly. 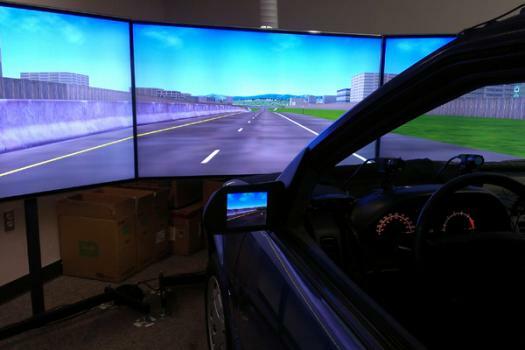 Using a driving simulator as well as a special car that can videotape driver performance on the road, Jerath will investigate whether or not patients with CMT1A can drive normally. If they are found to have driving difficulties, Jerath says, she hopes the findings can be used to develop devices that might help people with CMT1A to drive more safely. SMA - Stephen Kolb, M.D., Ph.D.
Stephen Kolb, an assistant professor in the Departments of Neurology and of Molecular & Cellular Biochemistry at Ohio State University, has been awarded an MDA human clinical trial grant totaling $183,354 over three years as supplemental funding for the SMA NeuroNEXT biomarkers study. This study is being conducted by the U.S. National Institutes of Health (NIH) to compare children with and without spinal muscular atrophy (SMA) during the first two years of life. 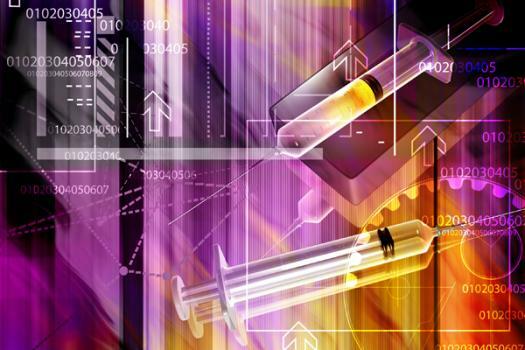 Its purpose is to determine measurements of SMA progression during this period so that these measurements (“biomarkers”) can be used to assess the effects of experimental treatments in future trials. The MDA funding will allow additional training of evaluators of motor function. 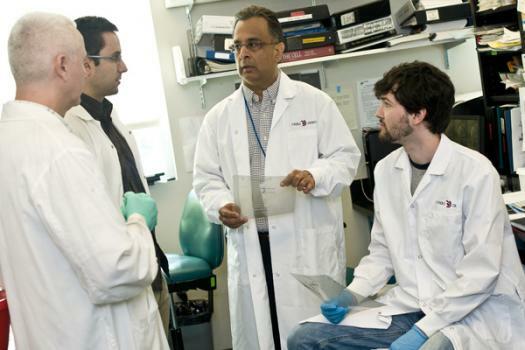 Funding for this MDA human clinical trial grant began June 1, 2014. SMA - Rashmi Kothary, Ph.D.
Rashmi Kothary, a senior scientist in the Regenerative Medicine Program at Ottawa Hospital Research Institute in Canada, has been awarded an MDA research grant totaling $253,800 over three years to further investigate a potential new treatment approach for spinal muscular atrophy (SMA) . Kothary and colleagues will continue to develop inhibitors of an enzyme called rho kinase to see if they are beneficial in this disease. Early experiments in mice have shown promise. Muscle disease - Shihuan Kuang, Ph.D.
Shihuan Kuang, an associate professor of animal sciences at Purdue University in West Lafayette, Ind., has been awarded an MDA research grant totaling $253,800 over three years to investigate the use of low-oxygen conditioning of cells to improve stem cell-based therapies to treat muscular dystrophies. CMS/LGMD/PP - Jocelyn Laporte, Ph.D.
Jocelyn Laporte, a team leader at the Institute of Genetics and Molecular and Cellular Biology in Strasbourg, France, was awarded an MDA research grant totaling $253,800 over three years to develop drugs to treat certain types of congenital myasthenic syndromes (CMS), limb-girdle muscular dystrophy (LGMD) and periodic paralysis (PP) . Using cells taken from patients with these disorders and animals with conditions mimicking these disorders, Laporte and his colleagues will test the effects of drugs that act on the flow of calium. 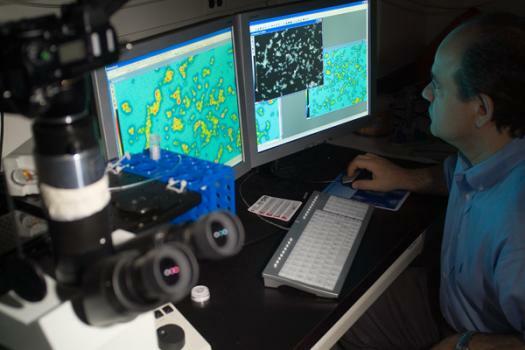 They will investigate whether drugs that act on cellular calcium should be developed as treatments for various muscle disorders and possibly for muscle aging. CMD/LGMD - Maria Chiara Manzini, Ph.D.
Maria Chiara Manzini, an assistant professor of pharmacology, physiology and integrative systems biology at George Washington University in Washington, D.C., was awarded an MDA research grant totaling $253,800 over three years to identify specific genetic mutations underlying congenital muscular dystrophy (CMD) and limb-girdle muscular dystrophy (LGMD) in patients who do not have a genetic diagnosis and to study the effects of these mutations in zebrafish, with an eye to treatment development. 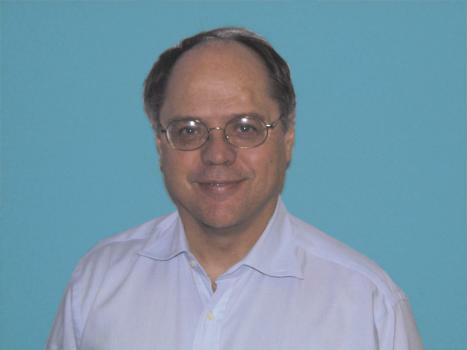 LEMS - Stephen Meriney, Ph.D.
Stephen Meriney, a professor of neuroscience and psychiatry at the University of Pittsburgh, will conduct experiments in cells and mice to test a drug that may be beneficial in Lambert-Eaton myasthenic syndrome (LEMS). CMT/DSD - Kelly Monk, Ph.D.
Kelly Monk, an assistant professor of developmental biology at Washington University in St. Louis, was awarded an MDA research grant totaling $253,800 over three years to investigate a possible therapeutic avenue for treating Charcot-Marie-Tooth disease (CMT) and the related Dejerine-Sottas disease (DSD). Monk and her colleagues have previously found that a protein called GPR126 is required for proper formation and maintenance of the myelin sheath that insulates fibers in the peripheral nervous system, and they will now study how this protein controls this process, which is known as myelination. 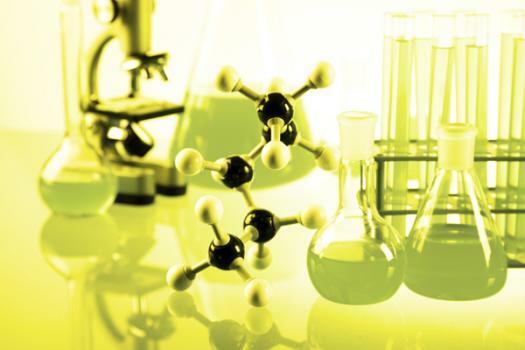 They will also look at the role of a related protein called GPR56 and will investigate whether either or both of these proteins could represent new drug development targets for CMT or DSD. DMD - Federica Montanaro, Ph.D.
Federica Montanaro, Ph.D., a principal investigator at the Center for Gene Therapy at Nationwide Children's Hospital in Columbus, Ohio, and an assistant professor of pediatrics at Ohio State University, was awarded an MDA research grant totaling $253,800 over three years to study how decreased activity in a biochemical signaling pathway called "hedgehog" affects muscle stem cells during muscle repair. She will find out whether increasing hedgehog signaling in mice with a DMD-like disorder preserves muscle function. MM - Carlos Moraes, Ph.D.
Carlos Moraes, a professor of neurology, cell biology and anatomy at the University of Miami (Fla.), has been awarded an MDA research grant totaling $253,800 over three years to study a potential treatment for mitochondrial myopathies, conducting experiments in human cells and in mice. Mitochondria, the energy-producing parts of cells, contain their own DNA, which can develop mutations (flaws) and cause disease. Moraes and colleagues will study DNA-cutting enzymes targeted to mitochondria, hoping to develop this technology to correct disease-causing defects in mitochondrial DNA in patients. 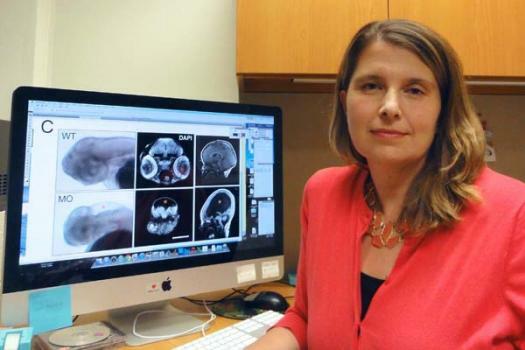 SMA - Lyndsay Murray, Ph.D.
Lyndsay Murray, a lecturer in anatomy at the University of Edinburgh in Scotland, has been awarded an MDA development grant totaling $152,280 over three years to determine the earliest changes in gene activity that occur in spinal muscular atrophy (SMA). By conducting experiments in mice with and without an SMA-like disorder, Murray and colleagues will study the genetic changes that occur prior to the death of nerve cells in the SMA-like condition. The work is expected to lead to new ideas of how to protect nerve cells that carry SMA-causing abnormalities. Funding for this MDA development grant began May 1, 2014. DMD - Terence Partridge, Ph.D.
Terence Partridge, a professor at Children’s Research Institute at Children’s National Medical Center in Washington, D.C., was awarded an MDA research grant totaling $253,800 over three years to develop and test a new type of compound that causes exon skipping – a way for cells to make functional proteins from flawed genes -- as a potential treatment for Duchenne muscular dystrophy (DMD). 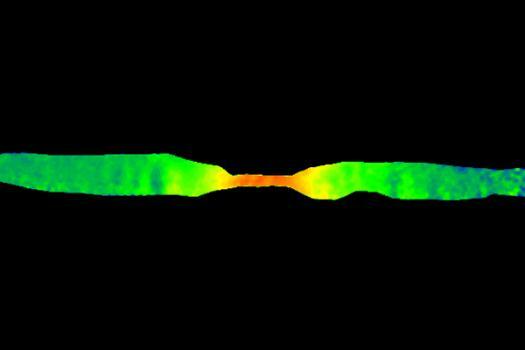 Current exon-skipping drugs for DMD have limited, if any, ability to enter heart muscle cells. 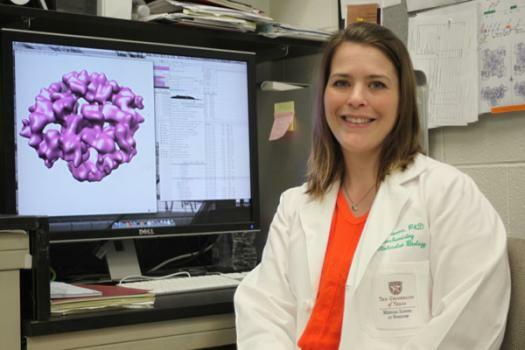 Partridge is studying an exon-skipping compound that appears to enter the heart in addition to skeletal muscles and will test it in mice with a DMD-like disorder. Catarina Quinzii, an assistant professor at Columbia University Medical Center in New York, has been awarded an MDA research grant totaling $253,800 over three years to investigate how flaws in the gene for a protein called RMND1 lead to abnormalities in mitochondria, the energy-producing parts of cells. 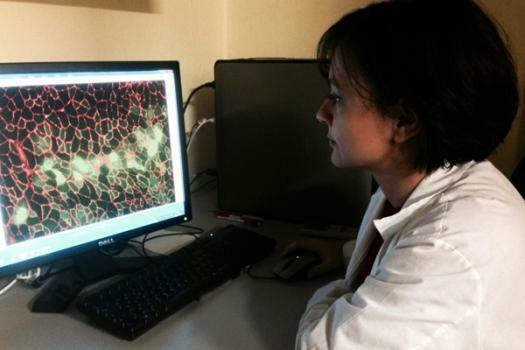 Quinzii will conduct experiments in human cells, mouse cells and mice with abnormal or deficient RMND1 protein, with an eye to developing a treatment for a human mitochondrial myopathy that results from an RMND1 gene mutation. DMD - Erica Reeves, Ph.D.
Erica Reeves, a biologist and vice president of research and operations at ReveraGen BioPharma, was awarded an MDA translational research grant totaling of $1,015,200 over one year to conduct the first human trial of VBP15, an experimental drug in development to treat Duchenne muscular dystrophy (DMD). This first trial will be in healthy volunteers. VBP15 is designed to combat inflammation and improve membrane stability in DMD-affected muscles and to provide the benefits of corticosteroid drugs like prednisone without or with reduced side effects. The grant was awarded through MDA's Venture Philanthropy (MVP) program. 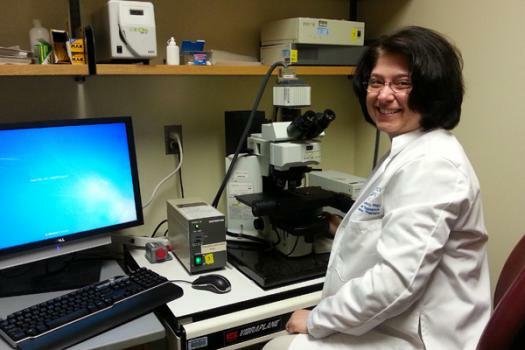 Funding for this MDA translational research grant began June 2, 2014. CMT - Michael Shy, M.D. 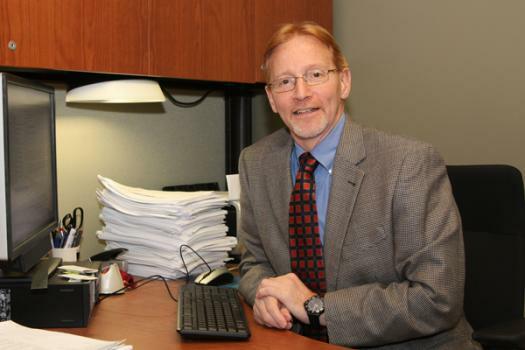 Michael Shy, a professor of neurology and pediatrics at the University of Iowa, has been awarded an MDA research grant totaling $253,800 over three years to develop a clinical trial to test a treatment for patients with the type 1B form of Charcot-Marie-Tooth disease (CMT). Based on previous MDA-supported work in mice with a CMT1B-like disorder, Shy and colleagues believe that treating a cellular phenomenon called the ER stress response may help CMT1B patients. CMT - Ludo Van Den Bosch, Ph.D.
Ludo Van Den Bosch is investigating the possible use of a compound known as an HDAC6 inhibitor in treating type 2F CMT and possibly other disorders of the nervous system. 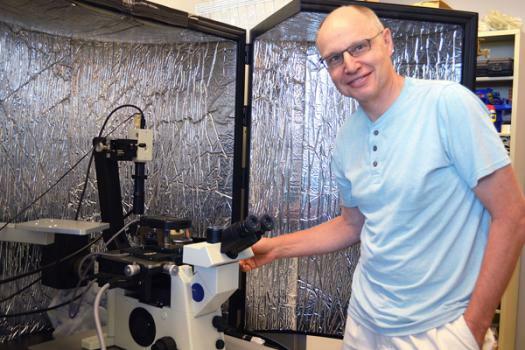 Ludo Van Den Bosch, a professor in the Department of Neurosciences at KU Leuven in Leuven, Belgium, was awarded an MDA research grant totaling $235,020 over three years to study the type 2F form of Charcot-Marie-Tooth disease (CMT) and investigate a possible treatment for it. Van Den Bosch and colleagues will conduct experiments in mice with a disorder mimicking human CMT2F, which have been shown to benefit from treatment with a compound known as a histone deacetylase 6 (HDAC6) inhibitor. They hope to find that HDAC6 inhibition has the potential to treat CMT2F and possibly other disorders of the nervous system, including perhaps other forms of CMT. DMD - Da-Zhi Wang, Ph.D.
Da-Zhi Wang, an associate professor of pediatrics at Boston Children's Hospital and Harvard Medical School, was awarded an MDA research grant totaling $253,800 over three years to study the role of a compound called miR-155, a "microRNA," in muscle function and regeneration and to see whether reducing it could help treat Duchenne muscular dystrophy (DMD). 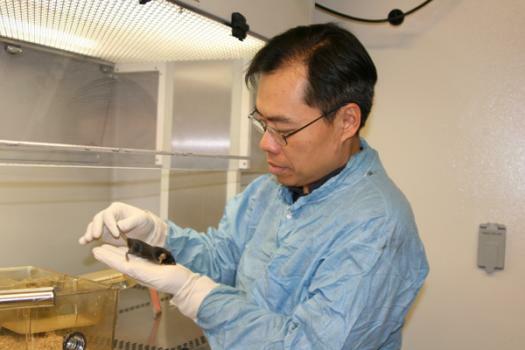 Wang has found that mice with lacking miR-155 have better muscle function and regeneration than mice that have this substance. 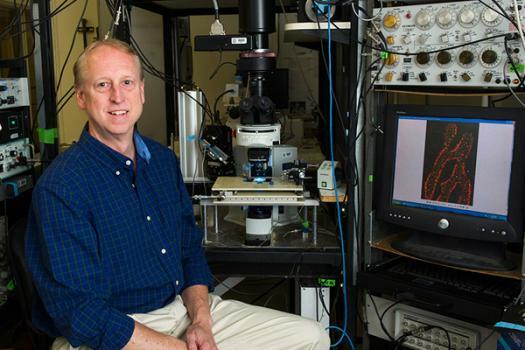 He and his colleagues will study mice with a disorder resembling human muscular dystrophy to define the function of miR-155, with an eye to therapy development targeting this compound. EDMD - Howard Worman, M.D. Howard Worman, a professor of medicine, pathology and cell biology at Columbia University in New York, has been awarded an MDA research grant totaling $253,800 over three years to study genetically modified mice that lack two proteins — emerin and LAP1 — and develop a disorder mimicking the X-linked form of Emery-Dreifuss muscular dystrophy (EDMD). He will study disease progression in these mice and test a potential new treatment in them. 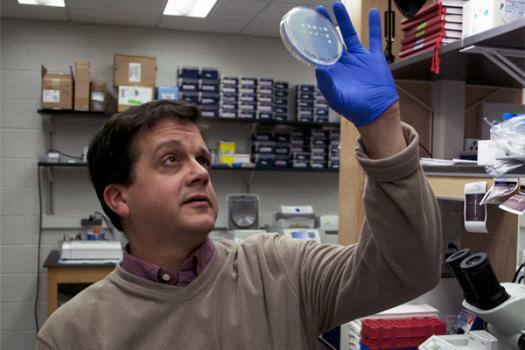 MMD/DM - Steven Zimmerman, Ph.D.
Steven Zimmerman, a professor of chemistry at the University of Illinois at Urbana-Champaign, has been awarded an MDA research grant totaling $253,800 over three years to develop experimental drugs to treat type 1 myotonic muscular dystrophy (MMD). 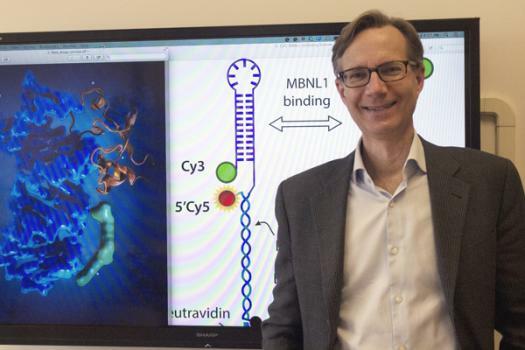 Conducting experiments in cells and mice with an MMD-like disorder, Zimmerman and colleagues will test a new compound that keeps the MBNL1 protein away from genetic material called RNA. Abnormal interaction between these two substances is believed to play a major role in type 1 MMD.